We have stayed at William Watson Lodge several times over the years. This is a really special place, nestled in the heart of Kananaskis Country, which provides year-round, barrier-free lodging for persons with disabilities, seniors and their families. William Watson Lodge is located in Peter Lougheed Provincial Park, on the edge of Lower Kananaskis Lake. It is about 25 minutes south of the Kananaskis Village on Highway 40. William Watson Lodge has 22 fully accessible cabins of varying sizes. 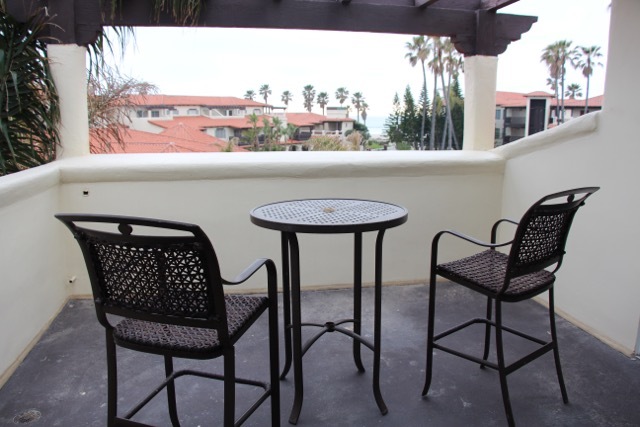 Some are one and two bedroom units ($30 per night) and some are three bedroom units ($40 per night). Every unit has a wheel-in shower, full kitchen, kitchen supplies, living room with pull-out sofa bed and dining table with chairs. Each unit also has tracks on the ceiling for moving people from the bedroom to the bathroom. Some of the cabins are pet friendly. They are slowly replacing the older cabins with beautiful new cabins. We recently stayed in one of the new cabins for the first time and it was modern, clean and really nicely decorated. They put a lot of thought into the design of these cabins in order to make the space as easy as possible for those with mobility challenges. 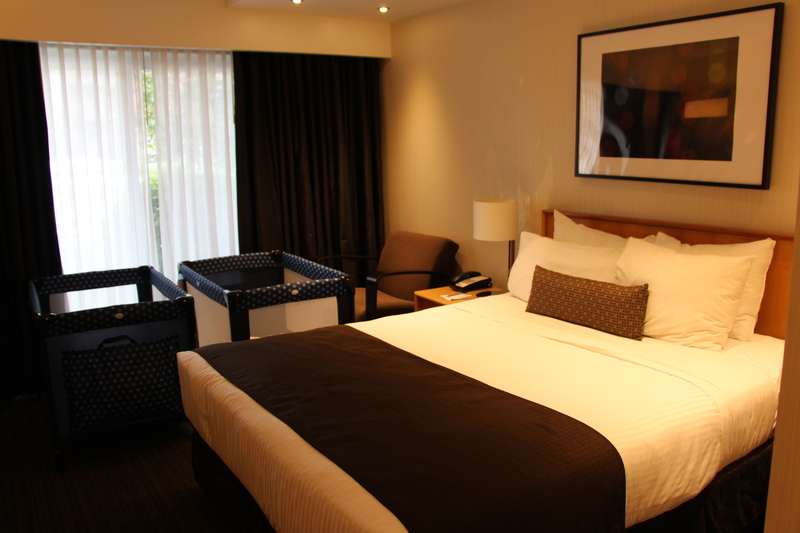 The ambience is very homey and it makes for a perfectly relaxing stay. Our unit had three bedrooms. Each bedroom had two beds in it, a dresser and a window. Our unit had two bathrooms. The first bathroom had a full bathtub, a raised toilet seat and a pedestal sink. One cool thing about this bathroom was that the shower rod holding the curtain could swing completely out of the way and then swing back to be tension fit on the wall. The second bathroom had a huge wheel-in shower with a built-in shower bench. The flooring throughout the unit was laminate, making it very easy to wheel around on. The main lodge, where guests check in and check out, also has a number of amenities. There is a large fireplace, a big deck out back, books, magazines, board games, bikes, sleds, and snowshoes for borrowing and coin-operated laundry machines. William Watson also has RV camp sites, an accessible comfort camping trailer and an accessible comfort camping hut. It is worth investigating all of the options if you are looking for a real wilderness experience. Around the cabins are a number of barrier-free paved pathways and over 20km of accessible trails. In the summertime, they are completely clear and easy to traverse. In the winter, due to the volume of snow in the mountains, the pathways around the cabins are kept clear but the trails accumulate snow. People enjoy snowshoeing and cross-country skiing on the network of trails that surround the lodge. There is a sit-ski available for borrowing as well as a sled for pulling those with mobility challenges through the snow. It attaches to a harness that an able-bodied person can wear in order to pull the sled behind them. There is an accessible playground about 2 minutes down one of the main trails. In the summer, it is completely clear and easy to get to. In the winter, that particular trail is impassable in a wheelchair but relatively easy to get to on a sled or on skis. There are accessible picnic sites and campfire sites, so if you come with a group of people there are lots of outdoor spaces to use for gatherings. One bad thing about William Watson Lodge is that it is completely outside of cellphone range and there is no internet availability. The lodges also have no TVs, so you can feel very isolated. Once you get used to the lack of connectivity, it actually feels nice to have the time to focus on other things. We usually read lots of books when we are there and we enjoy the family time. The cabins do not come equipped with any bedding, so you do need to bring your pillows and blankets with you. This can make for a number of trips to and from the car when you are loading and unloading. You also need to bring your own towels. When you check in to your room, you are given a cleaning list. The cleaning tasks are less onerous than they used to be but they do expect you to help out to cut down on costs (i.e. you have to vacuum, clean all the dishes, wipe all surfaces, empty garbages, etc.). 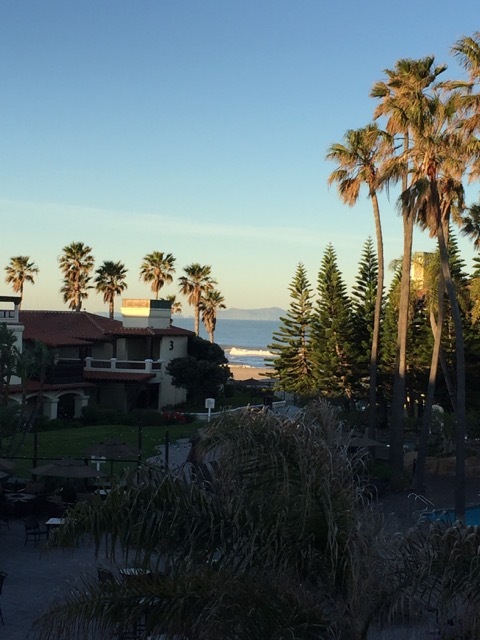 After I have finished packing, cleaning and hauling all of our stuff out to the car, I am usually pretty exhausted, but the price reflects the amount of work you have to put into your stay here. People with disabilities living in the province of Alberta get first priority and can make reservations up to 4 months in advance for the severely disabled (non-ambulatory, legally blind, profoundly deaf, dependently cognitively disabled). Those with less severe disabilities can make reservations 3 months in advance (semi-ambulatory, medically fragile). Alberta seniors (65 years and older) can make reservations up to 2 months in advance, space permitting. Some of the older cabins are getting a bit ugly. They are definitely cozy and rustic but the carpets, kitchens and bathrooms are showing their age. If any are available, I would recommend requesting a new cabin. Overall, William Watson Lodge is an absolute treasure. The fact that we have this amazing place right here in Alberta is really special. Everyone can enjoy the mountain parks and everything that the great outdoors has to offer and William Watson makes that possible for so many who would otherwise have difficulty finding a comfortable place to stay. We stayed at The Grand Okanagan for 5 nights in April of 2017. Kelowna is one of our favourite places as it is beautiful, the weather is usually great and there are lots of things to see and do there. I have stayed at this Resort many times before but this was our first time staying there as a family. 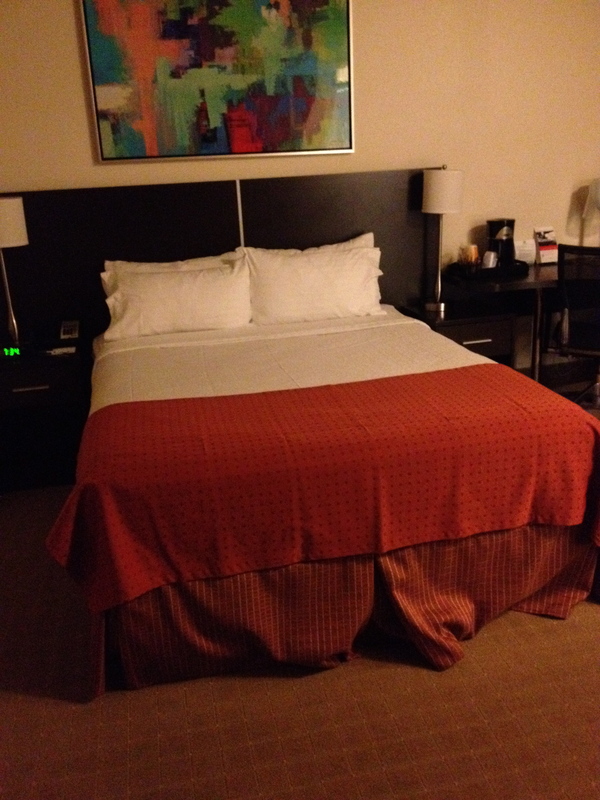 You know the saying, “You get what you pay for?” Well, this is usually true of hotels, and The Grand is no exception. The room rates aren’t cheap; they ranged between $250 and $300 per night when we stayed there. But from the moment we checked in, we felt like guests. The bell staff at the front of the hotel was absolutely amazing. They helped us with our bags, carried everything to our room, chatted with us about things to see and do, and within a few minutes of settling in, they brought presents up to the room for the kids. During our stay, they also brought us a card and offered us a complimentary movie complete with popcorn delivered to our door. We ran into one of the staff members downtown on her day off and she stopped on her bike to say hello and see how we were doing. The level of service we experienced at this hotel was way above average. Our room was on the second floor of the hotel side (there is also a timeshare side). The room itself was pretty basic but the bathroom was huge. 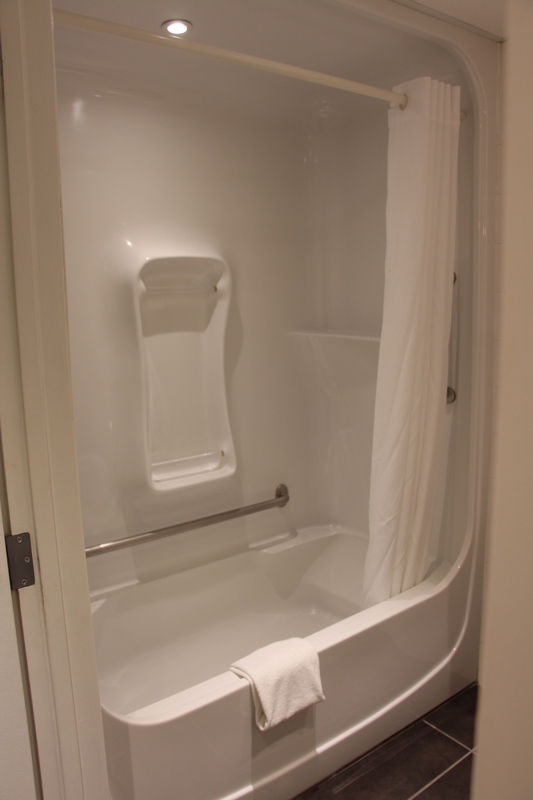 There was a wheel-in shower with built-in shower bench, wheel-under sink and toilet with grab bars. There was a massive turning radius in the bathroom! The location of the Grand is amazing. It is on Water Street, which is a very popular area. In one direction, you can take a short walk to downtown, passing by a huge Cactus Club and the Kelowna Yacht Club. In the other direction, you can walk along a beautiful boardwalk around the lagoons. 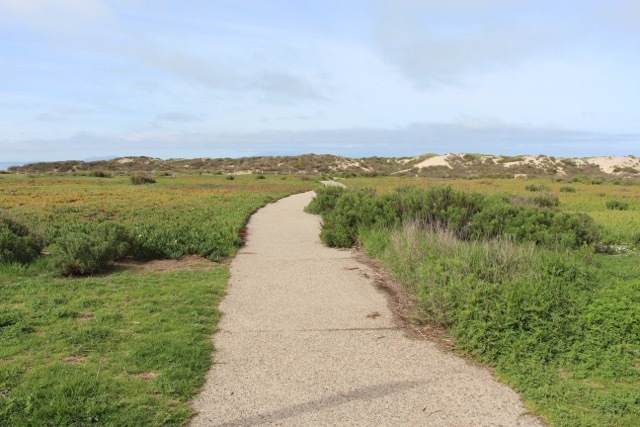 There is a very peaceful nature reserve not far from the boardwalk as well. Across the street is the Kelowna Art Gallery and a block away is the public library. 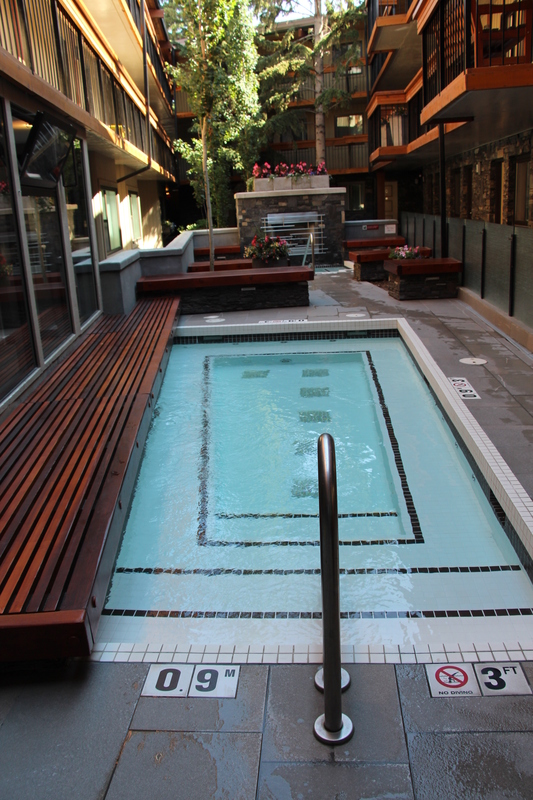 The Grand has a spa, large fitness facility and indoor/outdoor pool. There was a hot tub inside and a small hot tub outside as well. There was no pool lift but the pool area, both inside and out was accessible. Kelowna is great for couples and families alike. There is a lively nightlife in Kelowna in the summertime for those looking to go out. For those with little kids, like us, there is a great playground and splash park in the Kelowna City Park downtown. You can also spend time walking along the beach and splashing in Lake Okanagan. Although some of the playgrounds have pea gravel, the splash park is cement and the pathways are all easy to navigate in a wheelchair. There are loads of fun things to see and do in the City of Kelowna itself. There are lots of great places to walk, restaurants to try and lots of shops to explore. One of the highlights for our family was a place called “Jump 2 It” that houses a bunch of giant bouncy castles. The kids bounced around in there for hours! It was immaculately clean, free for the adults to get in and they allowed outside food and drinks, so I thought it was a good find. Our room location in the hotel wasn’t great. We were right outside of the elevator bank on the second floor and just to the left of a walkway between the timeshare part and the hotel part. We could hear the elevator dinging all night long in addition to staff members hauling laundry carts and people talking in the hallway. It likely would have been a lot quieter on a higher floor. Parking at the Grand was an extra $20 a night. They had a covered parkade but there were several handicap parking stalls right outside the main entrance, so we parked there. We had to leave the keys with the valet people in case they needed the spots in an emergency, but it made it easier for us to come and go. The extra costs do, however, have a way of adding up. The Grand does not have any on-site laundry machines for guest use. We had to drive to a laundromat to wash our clothes. 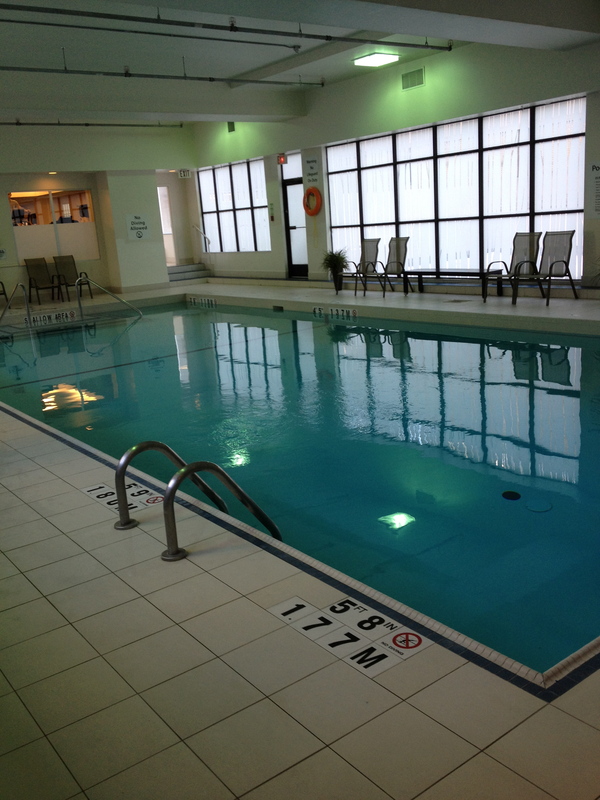 While we were there, the hotel shut down the indoor pool and the indoor hot tub for maintenance. I appreciate that things have to be fixed up from time to time, but the sign said it was scheduled maintenance and no one gave us a heads up about this when we called to book. We were there at a time of year when the outside temperature was still pretty chilly so swimming in the outdoor pool was not an inviting option. There is nothing ugly about The Grand. Overall, this is a great place to stay in Kelowna. It has everything you could want on site: pools, hot tubs, spa, fitness centre, bar, restaurant, shops, hair salon, casino, etc. and it is surrounded by beautiful scenery. The location is ideal for people who like to be close to everything. 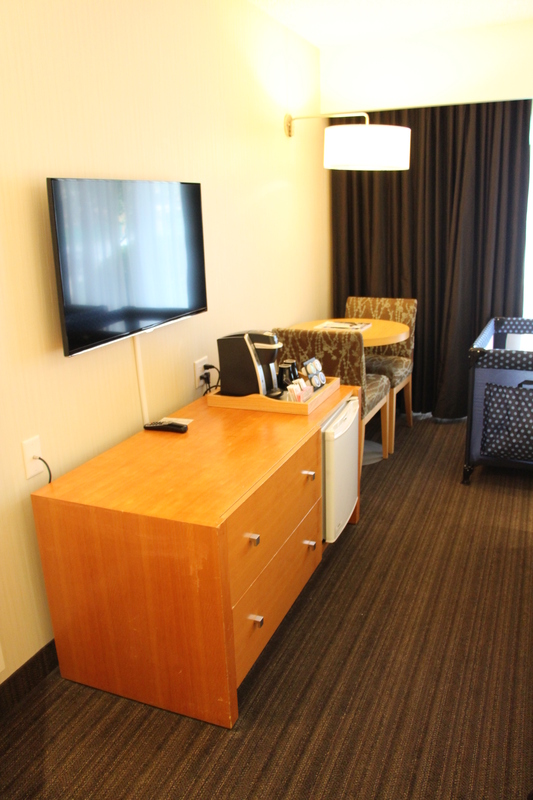 The staff here really go out of their way to make you feel welcome and to make sure that you have an excellent stay. When I mentioned the noise and the inconvenience of the closed pool upon checkout, they waived the cost of our parking for the entire stay, which saved us at least $100. The focus on hospitality is very apparent here and it makes for an above-average guest experience. We stayed at the Fairmont Hot Springs Resort for 2 nights in April of 2017. It took us about 3.5 hours to drive there from Calgary (we stopped for a nice lunch in Radium). The drive is very scenic and there are a number of beautiful stops along the way. I had extremely low expectations of our room at this Resort as when I called to book it, they told me they only had one accessible room and that it had absolutely no view. They said the windows faced a rooftop and because of the terrible view it was in their “economy” room category at a rate of $100 a night. I decided we might as well try it as I couldn’t locate any other accessible options in Fairmont. When we arrived and had a look around, we were very pleasantly surprised! The room (number 566) was rustic, but spacious; it had a queen-sized bed and a single bed. It took us a while to figure out, but the single bed was actually adjustable so you could raise the head or feet of the bed using a remote. The kids had a blast with that! 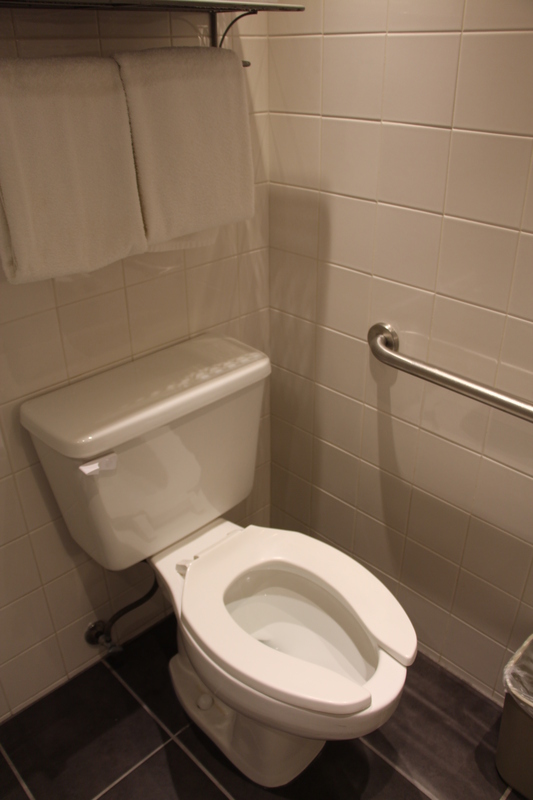 The bathroom was large with a wheel-under sink, toilet with grab bars and a bathtub with a built-in bench. There was a very peaceful indoor hot tub and steam room area on the lower floor of the Resort that was accessible by wheelchair. 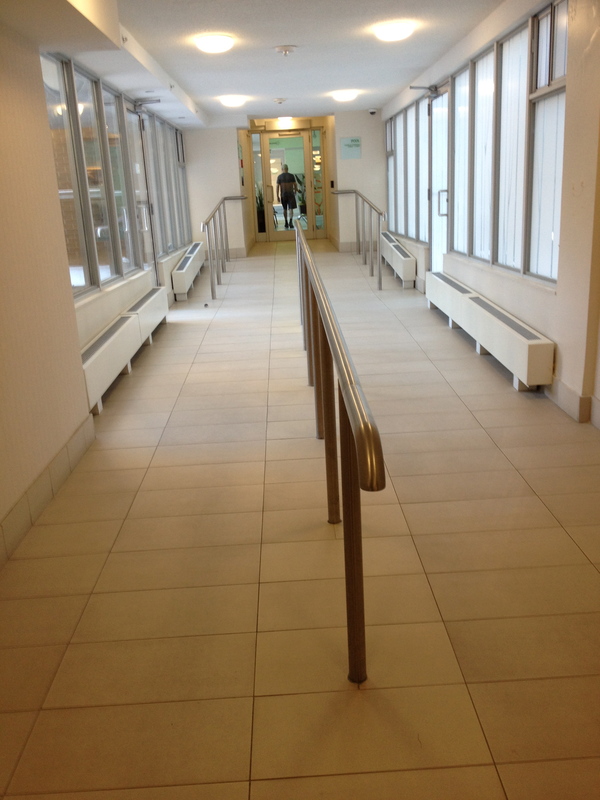 To get to the outdoor pool, you had to go up a long, indoor ramp to get to the door that led outside. The ramp was a bit steep, but not impossible. The outdoor soaking pool was for hotel guests only. It was spacious and the view of the sunset and nearby scenery from there was really breathtaking. Access to the Fairmont Hot Springs, Canada’s largest natural hot springs, was just a little further down the pathway from the guest pool. The Hot Springs are open to the public but, if you are staying at the Hot Springs Resort, you can access them for free. Wheelchair accessibility to get into the Hot Springs was questionable. There was a gate that you could go through at the top but then you would have to traverse down a large, grassy hill to get to the Hot Springs level. The men’s changeroom was accessible at the top but the women’s changeroom was down a set of stairs. Getting back up the hill after your swim would also be a major challenge. Can you imagine trying to wheel up a grassy hill soaking wet and in your swimsuit? Um, no thanks. They could definitely do some work on the accessibility of the public Hot Springs. This Resort had three or four food establishments to choose from and we were able to find decent food without any issues. The Resort provided amazingly soft bathrobes in each room. I loved the robes so much, I almost bought one for myself at the swim shop. Speaking of the swim shop, it was located adjacent to the entrance to the Hot Springs and its claim to fame is that it holds Western Canada’s largest collection of swimwear. 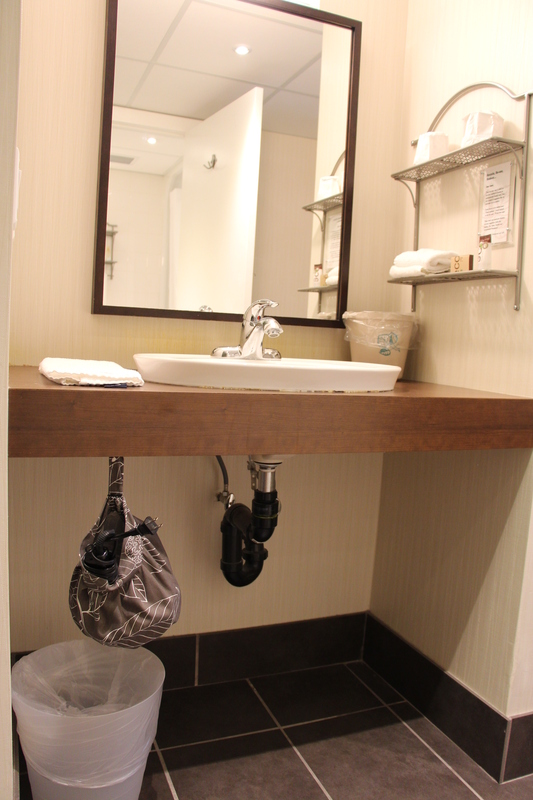 From the bathroom pictures, above, you may have noticed how far the bench is away from the taps and shower head. 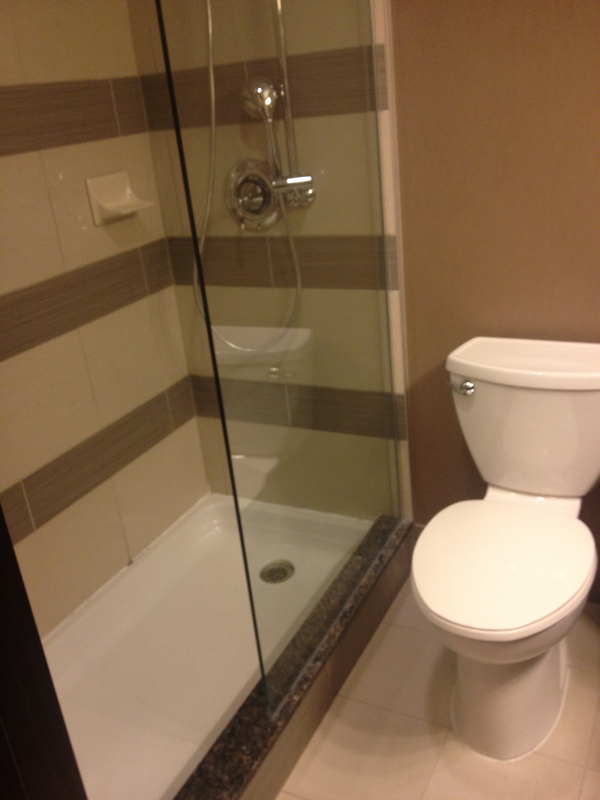 It would be extremely difficult for anyone sitting on the bench to use this shower without help. As I alluded to earlier, the view from the accessible room wasn’t great. We had 2 small windows that overlooked a rooftop. We didn’t spend much time in our room, however, so I felt it was a non-issue. The Resort has a lot of stairs as there are two wings connected by a central lobby/reception area. Once we got used to where we were going and where the elevators were, it was less of an issue but we couldn’t check in at reception and then head to our room because the only way to get there inside required going up the stairs. We had to go outside, up the hill and then inside a different door. This is a relatively minor hassle in the summer but it would be a major issue in the winter. Ugh – I will never forget this hotel stay as one of our kids injured his finger pretty badly in the bathroom door in our room. When we called the front desk to ask where the nearest hospital was, they sent one of their ski patrol personnel to our room in less than a minute. She arrived with her complete medical bag, bandaged his finger securely and gave us directions to the hospital in Invermere (about 25 minutes away). I was extremely grateful that they had someone on staff that could attend to him immediately and give us proper instructions, but the thought of it still makes me sick to my stomach. None of this had anything to do with the Resort of course but, for me, this was the only ugly part of our stay in Fairmont. This Resort is a great mountain getaway for anyone looking for a relaxing place to stay. Fairmont is pretty hilly, so be prepared for a really good workout if you are wheeling or walking outdoors. It is worth it to go out and explore as you’ll be able to take in the beautiful mountain views. If you enjoy golfing, there are several popular golf courses located in Fairmont as well. The price of the accessible room here was really reasonable, I thought, especially considering that it included free access to the Hot Springs. I look forward to going back to Fairmont sometime soon! We stayed at the Holiday Inn & Suites in Osoyoos, BC for 5 nights in April of 2017. This was our first trip to Osoyoos as a family and we picked this hotel largely because all of the other hotels I called in Osoyoos were booked solid. They all told me the same thing – Osoyoos gets a number of snowbirds that rent out the hotel rooms on a monthly basis through the winter and they don’t go home until the end of April. Apparently the wheelchair accessible rooms get booked up by people looking to escape the winter weather elsewhere in Canada. This isn’t too surprising given that the daytime average temperatures are higher in Osoyoos than anywhere else in Canada. The winters are shorter and milder and spring arrives earlier than in other parts of the Okanagan. If I could afford it, I would spend my winters in Osoyoos too! 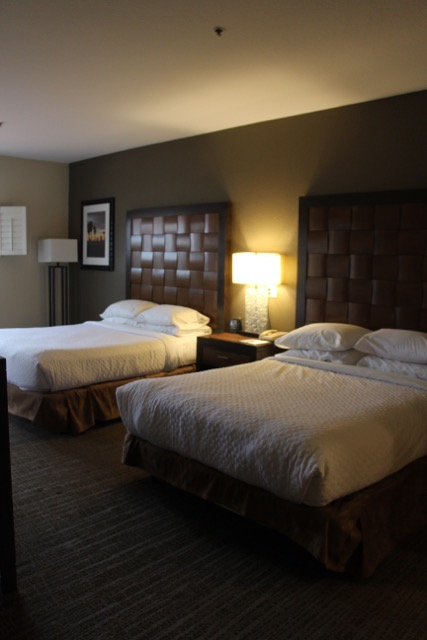 The Holiday Inn & Suites is located in one of the best spots in Osoyoos. It is right on a peninsula in the middle of Osoyoos Lake. There is a small private beach area in the back of the hotel and it is an easy walk to the larger public beach (Gyro Beach) and the downtown area. Our room rate for the accessible room with a wheel-in shower was $158.95 per night. The room was really well-appointed for a family. It came with two queen-sized beds in a separate bedroom, a large accessible bathroom with wheel-under sink, wheel-in shower (with built-in bench) and a toilet with grab bars. The rest of the room had a very large living space with a full-sized kitchen, dining area and living room with couches and a TV. There was a large balcony off of the living room which made for a nice spot to sit at the end of the day. There was free laundry available at the end of one of the hallways. The hotel also had a restaurant with a beautiful view overlooking the water. There was a pool, hot tub and fitness room located on the main floor. 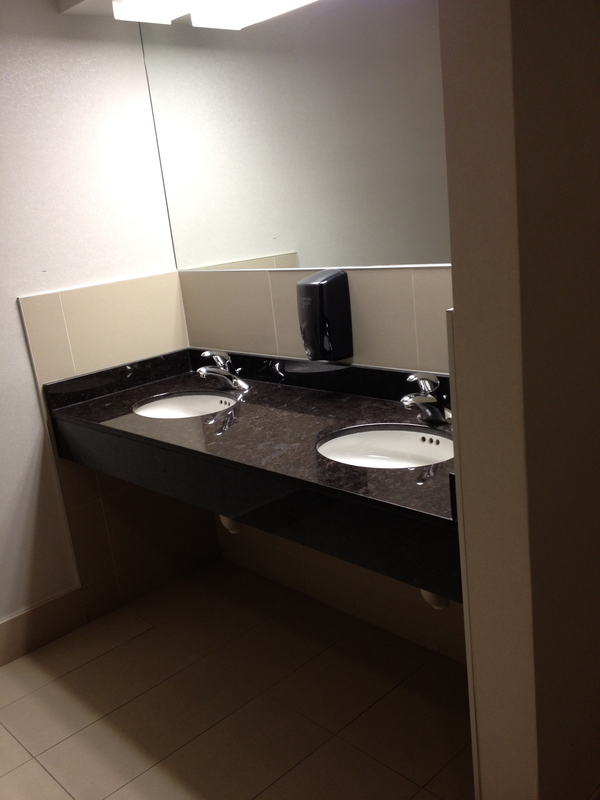 There was a large, accessible washroom located in the pool area. Our nightly rate included free, underground parking. This hotel is clearly not one of the finer properties in Osoyoos. It served its purpose, however, it is outdated, dirty and looks run down. It was probably in its prime 30 years ago. The wheel-in shower in our room had a built-in plastic shower bench. However, the bench was really far from the taps and it would be a challenge to stay on the slippery bench while trying to reach the taps. 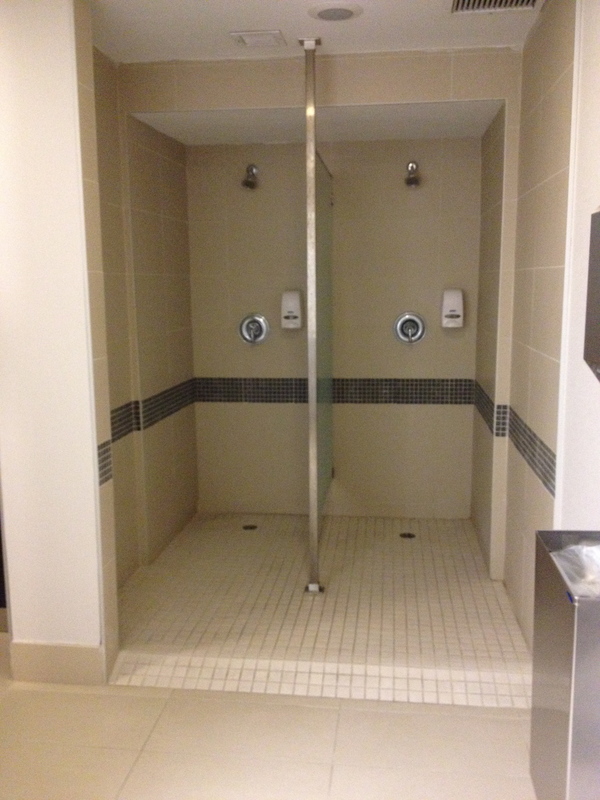 If you have mobility challenges, you may require help with this shower. The hotel had a pool and hot tub, however the pool wasn’t functioning for the first 3 days of our stay due to an issue with the pump. Also, every time I went to the pool area with the kids I had to go to the front desk to ask for towels as they weren’t stocked on the racks near the pool. They would often give me 2 towels for the three of us, which I found strange. When we checked in, they gave us “kids eat free” coupons for the restaurant. Apparently these coupons can only be used to order food off of the kids’ menu and when we ate at the hotel’s restaurant, we were told that they didn’t have a kids’ menu. The hallways and common areas in the hotel smelled very strongly of curry and other combinations of food and grease. Although the hotel itself wasn’t amazing, the location of this hotel was great. 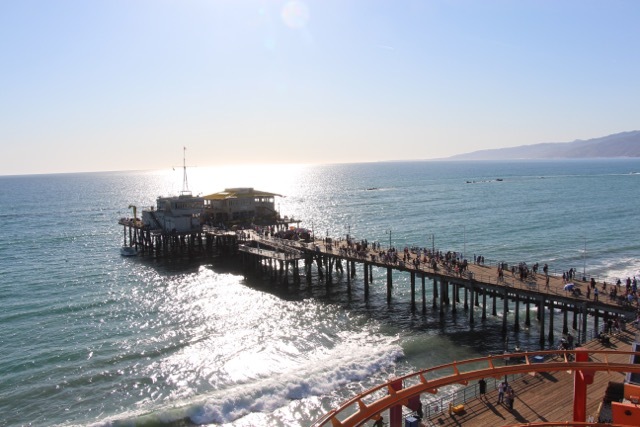 The view from the balcony was really beautiful and it was a very short walk to the public beach area and downtown. We were able to walk everywhere once we arrived. Some highlights of our stay in Osoyoos included the Desert Model Railroad (www.osoyoosrailroad.com) and the Rattlesnake Canyon Theme Park (www.rattlesnakecanyon.ca). The town also did an amazing family oriented celebration for Easter, complete with an Easter Egg Hunt, live music, petting zoo, face painting, games, bouncy castles, etc. At that time of year, the town felt a bit sleepy, but it was a great place to unwind, relax and enjoy the beautiful Okanagan air. I cannot believe it has taken me so long to write this post! This was one of our favourite hotel stays and I definitely want to go back to the BeachPlace Towers again. We stayed at this hotel for four nights in February of 2015 (2 bedroom villa, room 1116). 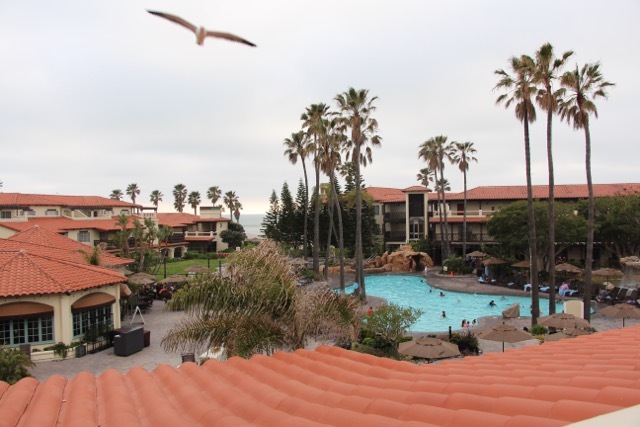 The hotel is located right on the beach, within walking distance to restaurants, shops, playgrounds, entertainment and lots of beautiful scenery. Our two-bedroom villa was huge and fully wheelchair accessible! We had two full bedrooms, each with a king-sized bed, two bathrooms (one was fully accessible), a huge jacuzzi tub, kitchen, dining area, living room, pull-out sofa, washer and dryer, balcony, etc. The view from our balcony was absolutely amazing. We got to watch boats come and go all day long and admire the gigantic houses across the water. Watching the sun go down and taking in the city lights from that vantage point was really quite breathtaking. This hotel was absolutely perfect for families. There was lots of room to explore, there was a splash park in the pool area and there was a huge playroom on the main floor of the hotel with a giant wooden ship for them to climb around on. The kids absolutely loved it. The hotel had a program of activities with things like craft time and movie night. They also had video games, board games, chess and other activities for older kids. The pool area was accessible. There was a ramp to get from the pool area to the hot tub area. The pool was equipped with a lift (the hot tub was not). There was also a pool-side bar where you could order food and drinks to enjoy by the pool or to take up to your room. The location of the hotel was perfect. It was set back a little bit from the road but it was in a complex with lots of restaurants and fast food options. We had a very short walk across the street to get to the beach. About 10 minutes away on the same street as this hotel, there was an accessible playground and mats for wheelchair users to get closer to the water. The kids had a ton of fun playing there. They had convenient foot showers and sprayers located at the entrance to the beach so you could get the sand off after playing. The entrance to this hotel was through a semi-sketchy parkade and it felt a bit strange walking through there after dark. A portion of this hotel is a timeshare for Marriott Vacation Club. We definitely got the timeshare vibe when we were staying there. We were invited to a sales pitch, which we declined. We checked out the Fort Lauderdale water taxi, which stops about a 5 minute walk from this hotel, but it was not accessible. There was no way that someone in a wheelchair could get themselves up the huge step to get onto the water taxi. That was a real shame as it would have been a great, inexpensive way to see more of Fort Lauderdale. There was nothing ugly about this hotel. This place was one of my favourite vacation stops for a number of reasons. The weather and the beach in Fort Lauderdale was amazing. It was sunny and humid and the evenings were absolutely beautiful. Having the two bedrooms with a full kitchen and washer and dryer was so great. I could make food for the kids that I knew they would eat and save us from having to eat out for every meal. The location of this hotel was perfect. We were right in the middle of the action and a stone’s throw away from the beach. 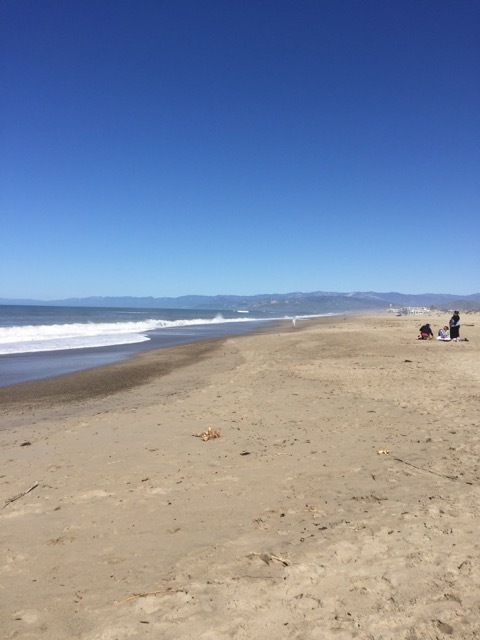 We took the kids to play in the sand and ocean every morning and then came back to shower off and have lunch. At dinnertime, we would walk to a nearby patio, listen to live music, sip piña coladas and watch the cruise ships sail away. Just thinking about it makes me want to go back there! We went on a 7-day Eastern Caribbean Cruise on the Regal Princess in February of 2015. The boat left the port in Fort Lauderdale and sailed first to Princess Cays (Princess Cruise Line private port), then to St. Thomas and lastly to St. Maarten before returning back to Florida. We had three full days at sea. We stayed in a wheelchair accessible balcony room (room B303) on the starboard side of the boat, close to one of the banks of elevators. This was very convenient for going to and from our room. The room was tastefully decorated with modern, neutral colours. 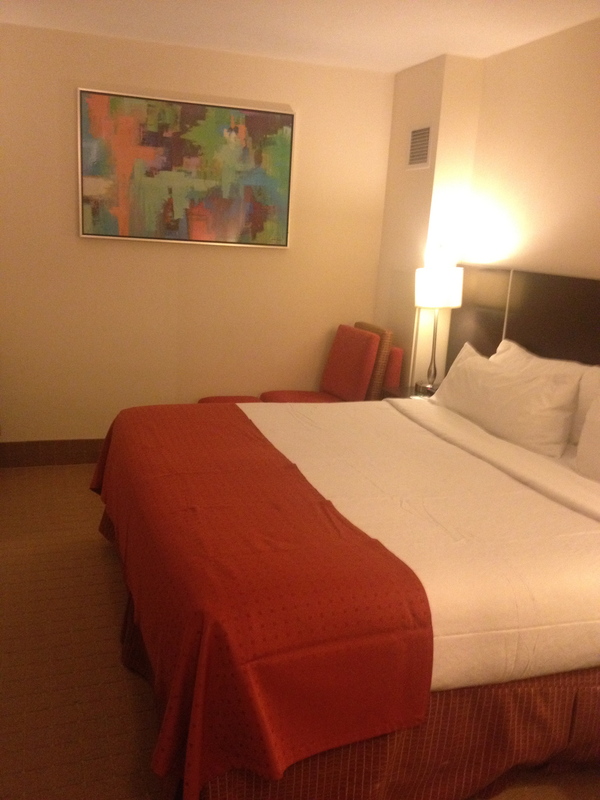 I am not sure why but our room only came with two twin beds. I had requested a queen instead of two twins but there must only be one configuration for this room. It worked out okay because we had to have two cribs in our room as well, so we put one of them in between our beds and one over by the balcony. 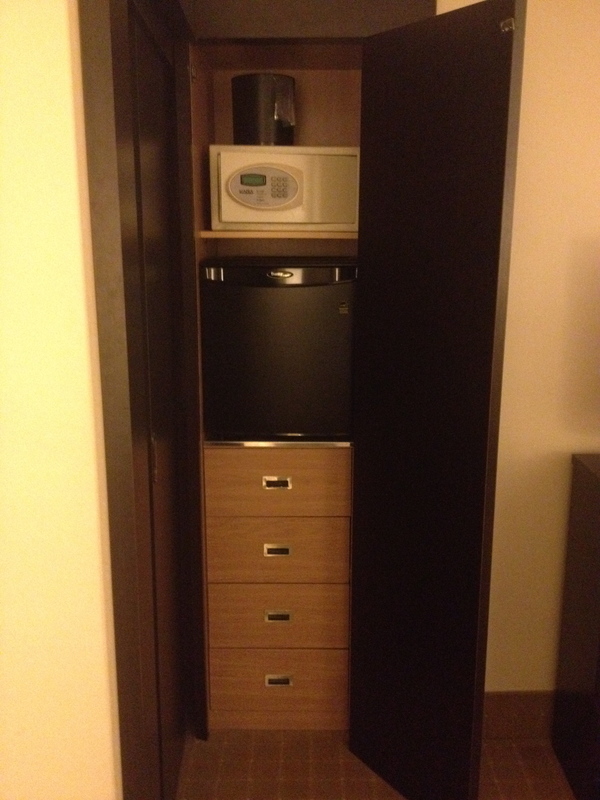 Although the room was not huge, there was lots of storage space in the room for luggage and clothes. Just to give you an idea, we had two strollers, four pieces of luggage, two playpen-type cribs, the wheelchair and all of us in the room. Having the balcony definitely helped as we were able to see the natural light and get fresh air into our room. 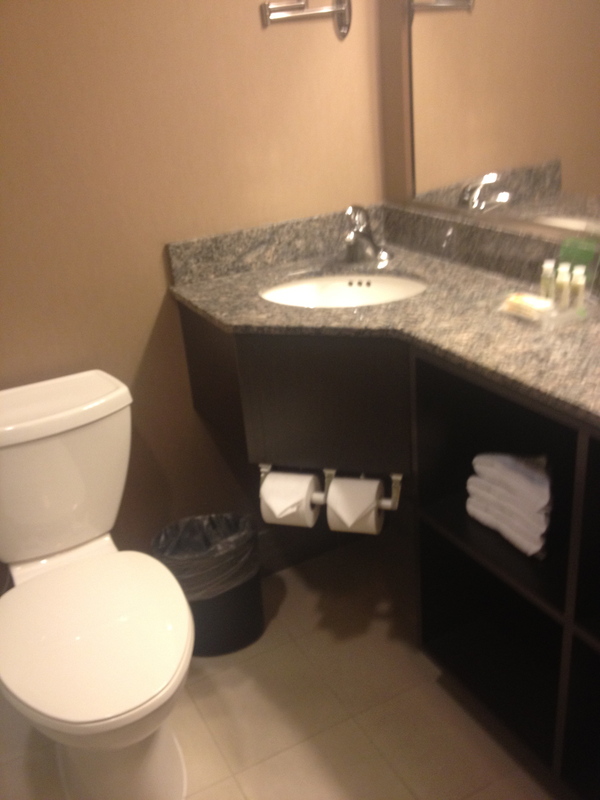 The bathroom in our room was great for accessibility. 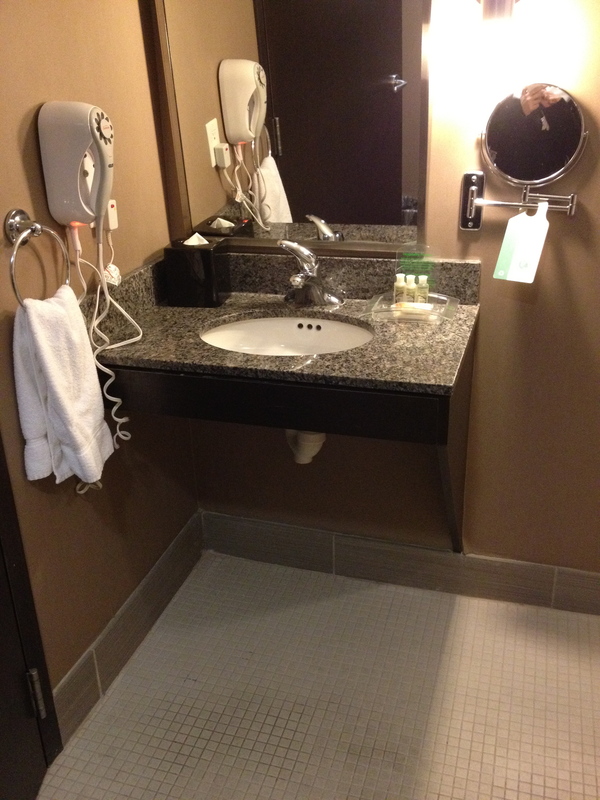 There was a wheel-under sink, a shower with a fold-down bench and a toilet with grab bars. There was even an alarm next to the toilet for someone to push if they were in distress in the bathroom. Unfortunately this alarm was well within reach of our little people and there was no way to disable it 🙂 We had the front desk calling us several times some days when our kids couldn’t keep their hands off of the buttons. The balcony was fully accessible. There was a metal piece that dropped down to cover the threshold after the sliding door was fully opened. The ship itself was very accessible. There were plenty of elevators, albeit slow ones. Several of the common areas had nice, smooth tile on the floors, making it easier for a wheelchair to get around. The back of the boat had a few different levels, which you could access via a lift. The very top level of the ship had a mini-golf course and you could access that level using a stair lift. As with most cruise ships, this one had something for everyone. The Regal Princess had a casino, theatre, spa, adults-only pool area, a gym, a walking/running track, movies under the stars and a night-time water show. The kids particularly enjoyed the Seawalk, which is a glass floor walkway that extends out over the edge of the boat so that you can look down into the ocean. Our first stop was at Princess Cays. This is a private island owned by the Princess Cruise Line and they use it as a port of call on their Caribbean cruises. This was a tender port and the cruise representatives said that my husband would only be able to get to the island if he could get onto the tender boat without assistance. Given that he can’t walk, this is impossible. We took our chances and headed down to the gangway and the people loading passengers on and off the tender boat had no issue carrying him on. I often find this to be the case. People are more than willing to help you when you are right in front of them but the official position often is that they aren’t supposed to do it. The boat ride to the island was about 5 minutes long. There was not much there other than the beach and a buffet-style lunch place, but the sand was soft and it was nice to get off of the boat for an afternoon. The island itself had some paved pathways that were easy to wheel on. Our next stop was St Thomas. Last time we were there, we realized that there wasn’t much to do if you didn’t have some form of accessible transportation. This time we got pro-active and booked an accessible excursion to the Magic Ice Bar. The vehicle that picked us up was an open air bus, but they had a lift at the back and it all went pretty smoothly. They were even able to fit two people in wheelchairs on the bus. The Magic Ice Bar was actually pretty cool (no pun intended!). When we walked in, they gave us big winter parkas to put on and, from then on, we felt right at home! There were ice sculptures everywhere and even ice slides for the kids. There was a long ice bar inside and they let us sample various flavours of rum (i.e. coconut, pineapple, cherry, etc.). Our last port on this cruise before heading back to Fort Lauderdale was St. Maarten. We had been here before and walked through the downtown shopping area that time. This time we decided to head to the beach and spend a day hanging out by the ocean. 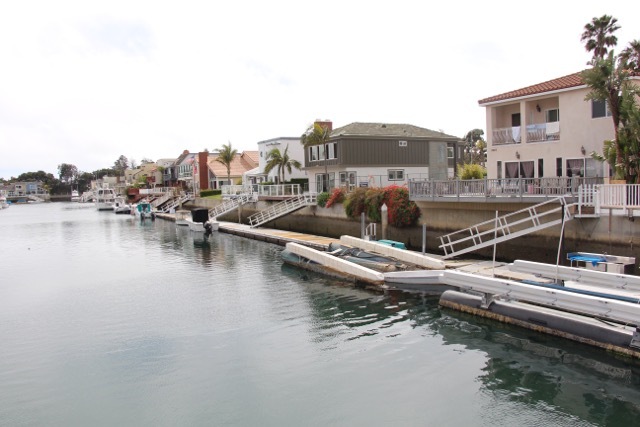 The water taxis to get to the downtown/beach area are not accessible per se, but the operators have always been extremely helpful and we have never had an issue getting on or off. We had to pay to rent a big beach umbrella to provide some shade on the beach but it worked out okay and the kids had a blast playing in the sand and water. All cruise lines operate differently in terms of dining, reservations, gratuities, etc. We found Princess somewhat more challenging with kids because if you wanted to eat anywhere other than the buffet, you had to book a reservation or wait in line for a long time. Because of this, we ended up eating at the buffet for every meal. The buffet food was good but the buffet area always felt very busy and it was sometimes tough to find a table. Getting through the hallways on cruise ships in a wheelchair can be a challenge, especially when luggage is left in the hallways on embarkation and disembarkation. It can also be a challenge getting to your room during the day when the housekeeping carts are in the halls. The best strategy is to book a room very close to the elevators so you don’t have to traverse a long hallway to get in and out of your room. This boat did not have an accessible pool or any accessible hot tubs and did not have any pool lifts. This cruise ship was definitely better-suited to adults or families with older kids. The boat had a mini-golf area, sports court and a shallow pool area but not a lot for younger kids. This was a very classy ship and it was practically new when we were on it. There was nothing ugly about it. The Regal Princess was a beautiful boat with some very cool features. I enjoyed the Seawalk and the water shows at night. I appreciated that they had room service and we had a very lovely room steward for the week who took good care of us. Although we didn’t suffer in the food department, I would have liked it if the specialty restaurants had more flexible dining options. 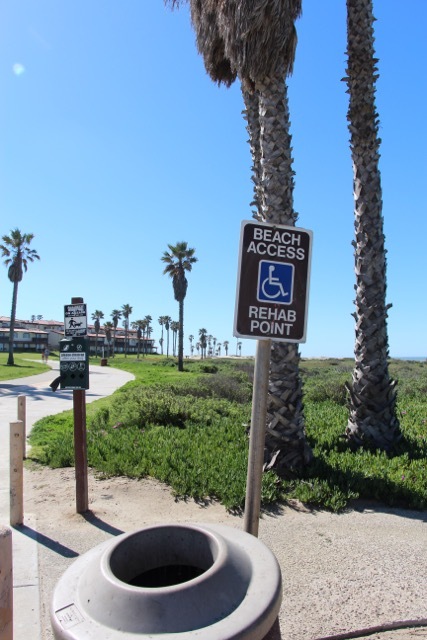 In terms of accessibility, this specific itinerary is a bit of a challenge for wheelchair users as two of the three stops require being hoisted onto a tender boat or water taxi. If you cannot walk at all, you may be better off selecting an itinerary with no tenders. If you have some mobility, however, you may find it to be more manageable than we did. We stayed in a wheelchair accessible room at the Polo Towers for the first time many years ago and recently stayed again for one week in August of 2016. The Polo Towers is conveniently located right on the strip between the MGM Grand and Planet Hollywood. There were lots of places to eat in front of the Polo Towers in a Hawaiian market of sorts, including a popular Chili’s restaurant. Our room was a two bedroom, two bathroom unit with a living room, sofa bed, full kitchen, kitchenette and two balconies. One bedroom and one bathroom were fully wheelchair accessible. 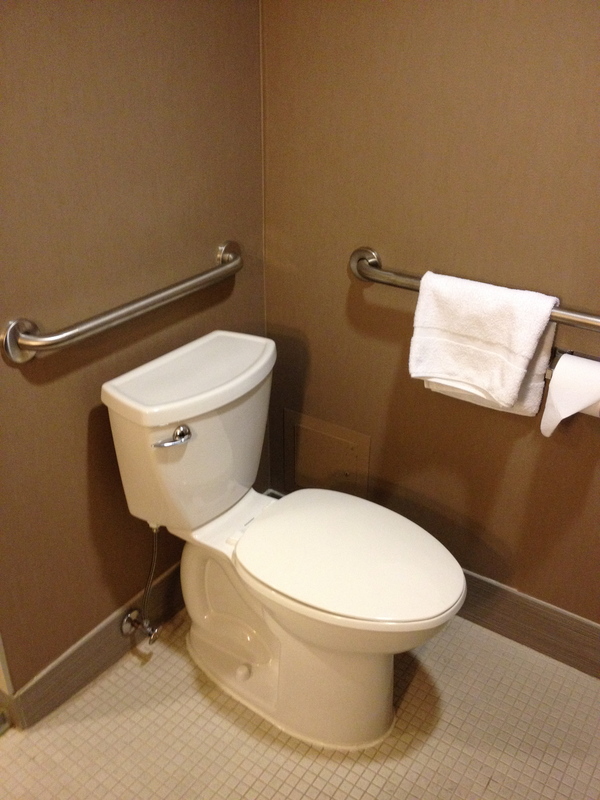 There was a handle on the bathroom door to make it easier for people with limited upper body mobility to shut the door. There was a door in between the second bedroom and the main living area that could be closed or locked for additional privacy. The bed in the second bedroom was a murphy bed, so it could be folded up to create additional living space. There was a small kitchenette on this side and a second bathroom (the door was wide enough to get in, but the bathroom itself was not accessible). The kitchen in the main living area was modified with lower counter tops and a wheel-under sink. There was a Room Valet panel on the wall in the accessible bedroom, living room and accessible bathroom with several cool features. You could turn it on to receive visual alerts when the phone rang, when the doorbell was pushed, for a wake-up call or when the fire alarm went off. You could also set the bed to vibrate for these same alerts (I know what you’re thinking but this would be really handy if you were sleeping and couldn’t see the visual alerts!). 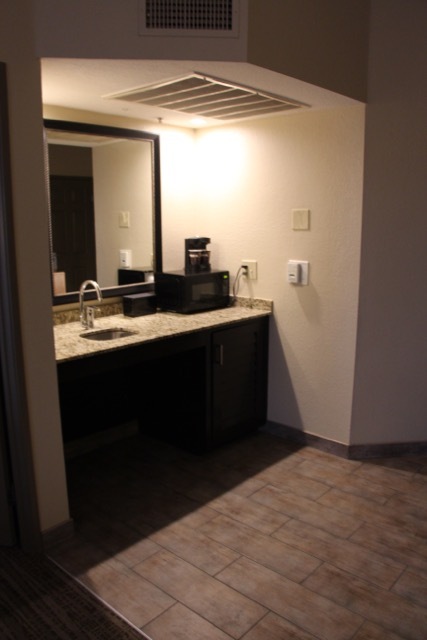 Each room had a closet, a dresser, TV, in-room safe and coffee maker. The entire hotel was accessible, including the entrances, exits, main lobby, washrooms on the main floor, fitness area, splash park and the roof-top pool area. There was a large cold pool and a smaller hot tub. 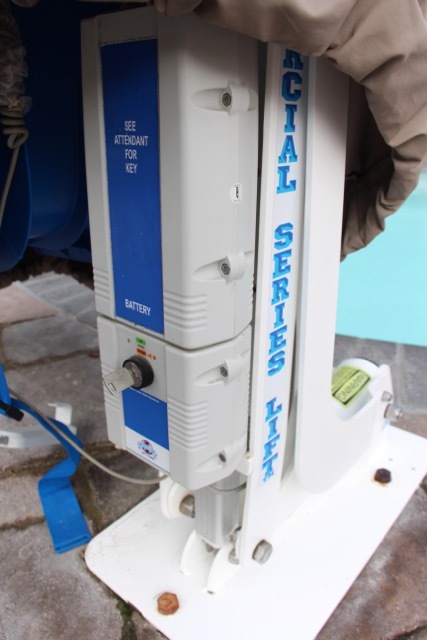 Both pools were equipped with a lift. There was an observation deck at the end of the pool area that was up a few stairs, however, there was an ADA lift so that people who could not climb the stairs could still get up to look around. This space provided a beautiful view of the strip at night! There was an amazing splash park in the back of the hotel, which was great for kids of all ages. Because of the shape of the hotel, the splash park stayed shaded all day long, which was perfect for everyone. Even though it was 40 degrees Celsius outside, the temperature in the splash park was quite comfortable. There was a shallow kiddie pool, sprayers, a play structure with slides and lots of room to run around. For the parents, there were several comfortable loungers along the sides, tables and chairs and a vending machine. There was no casino at this hotel. For some, this might be considered a drawback, but for us it meant a much quieter place to retire to and a smoke-free environment to walk through and sleep in each night. I cannot forget to mention that his hotel had free laundry machines on every other floor! I walked up one floor and had full access to the machines for as long as I needed them. There was enough laundry soap provided in our room for one load and there was a vending machine in the laundry room from which additional soap could be purchased. The view from our room was facing the front of the building, which was not a great view. We could see people coming and going and see the MGM Grand in the distance but otherwise there wasn’t much to look at. Our room did not have a bathtub. The accessible bathroom had a huge wheel-in shower and the other bathroom had a shower as well (note that the glass door on the other shower didn’t open or close properly, which was a bit dangerous for the kids). We managed fine but I really prefer hotel rooms that have a bathtub for the kids. The kitchen was not set up for guests with kids. The knives and all of the sharp implements were located in a cupboard that was very easily accessible for small people. As soon as we discovered this, we had to empty out the cupboards and move all of the sharp things to the top of the counter! Yikes! Not a Great Location for Knives When Kids are Around! The Wi-Fi in this hotel was atrocious! They provided us with a password and log-in information for the free Wi-Fi when we checked in but the signal strength was terrible and every time we lost the connection, we would have to go through the log-in process all over again. It was so unbelievably bad it was practically unusable. My husband got stuck in the lift between the pool area and the observation deck one night. He got part-way up and then it stopped working. He was able to access the emergency phone to call the hotel staff and I pulled the emergency release button to get him back down to the ground. The hotel sent a maintenance crew up and they worked on it for about 30 minutes to get the lift up and running again. The furnishings in our unit could have used an update. The couch in the living room, in particular, had a panel on the front that kept falling off exposing a bunch of sharp staples that little people could easily scratch themselves on. I kept trying to re-attach it to the couch but had little success. One of the toilets in our room was not working properly. It stopped flushing several times and we would have to call the front desk to request that someone in maintenance come and fix it. The first time this happened, we had just gotten back to our room and had a message on our machine saying that housekeeping noticed that one of the toilets wasn’t flushing properly and to call if we wanted maintenance to come and fix it. So what did we do? Naturally, we tried flushing the toilets. The one in the accessible bathroom overflowed everywhere and covered the bathroom floor in water. We called down to request that someone come and fix it and despite the fact that it was leaking everywhere, they said it would take about 30 minutes to get someone to our room (this was about 10pm). They did send someone up with a bunch of towels though! I would definitely stay at the Polo Towers again. 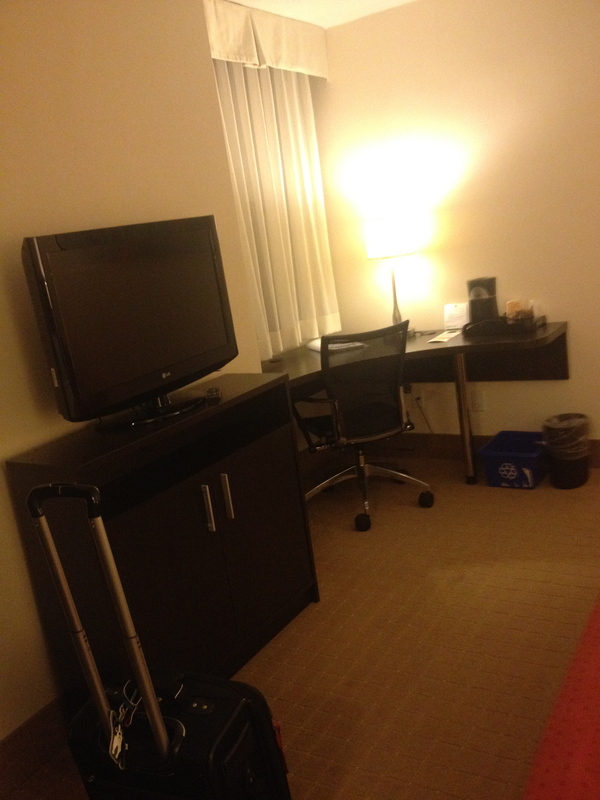 I think most of the bad elements were specific to our room and we probably would not have that same experience again. The proximity to the Miracle Mile Shops at Planet Hollywood was a bonus and the splash park was unbeatable for the kids. They started every day running around in there and had so much fun. The hotel was clean and quiet and our room was huge considering what you would get at a normal hotel in Vegas. The two bedrooms worked out great and having two bathrooms and a kitchen was ideal. 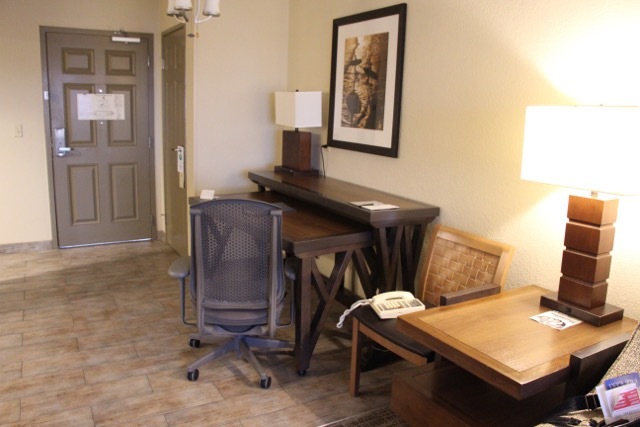 I think Polo Towers is a great option, particularly if travelling to Vegas as a family. We stayed in room 9301 at the Embassy Suites in March of 2016 for one week. 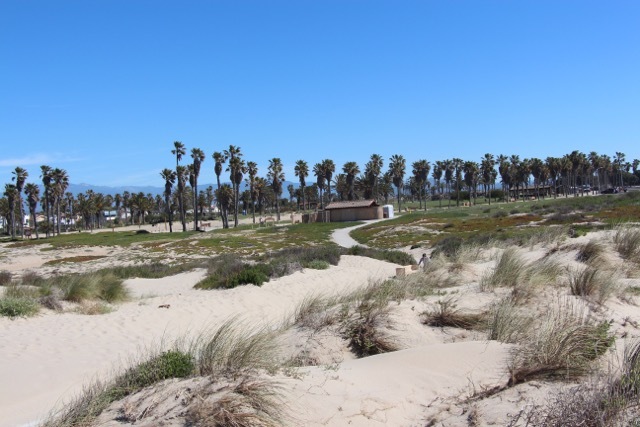 We booked this hotel knowing nothing about Oxnard, California other than that the hotel was right on the beach with some accessible pathways alongside the beach. 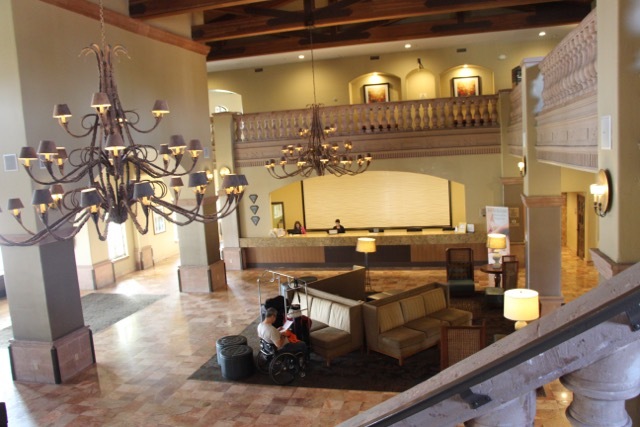 When we arrived, we were pleasantly surprised by the overall accessibility of the hotel and surroundings. There were several different buildings at this hotel and our room was on the third floor of building number 9, which was just to the right side of the main lobby building. All of the rooms at this hotel are suites. In our room, we had two queen beds in a separate bedroom, two bathrooms (one with a wheel-in shower and built-in shower bench, wheel-under sink and toilet with grab bars), living room with a pull-out sofa and small kitchenette (microwave, mini-fridge, coffee maker and sink). Our room was a “resort view” room. 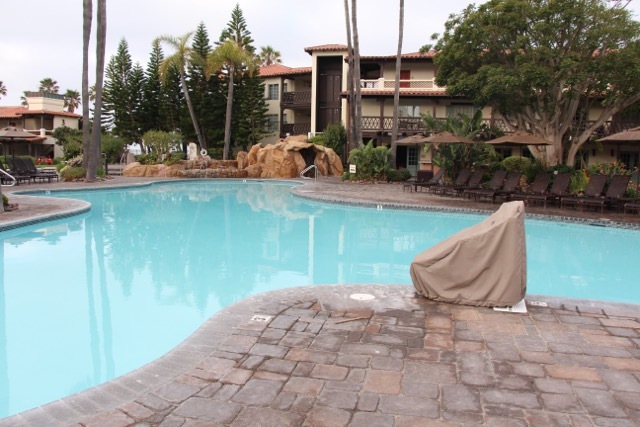 We had a nice view of the pool and courtyard and could actually see the beach and ocean in the distance. Our room was cleaned every day by the time we got back from our morning activity except for once. The staff seemed very efficient and happy to help. This hotel served free breakfast every morning until 10 am and free drinks and snacks every night between 5:30 pm and 7:30 pm. Breakfast was buffet-style with eggs, potatoes, pancakes, waffles, sausages, bacon, cereal, fruit, toast, yogurt and a selection of beverages. There was also a made-to-order section where you could order eggs or omelettes. The happy hour snacks consisted of nachos, veggies and party mix and the drinks consisted of alcoholic selections from the bar, punch and pop. Although the food wasn’t the best quality, it was plentiful and it made for an easy alternative to going out. There was one large swimming pool and two large hot tubs at the hotel. 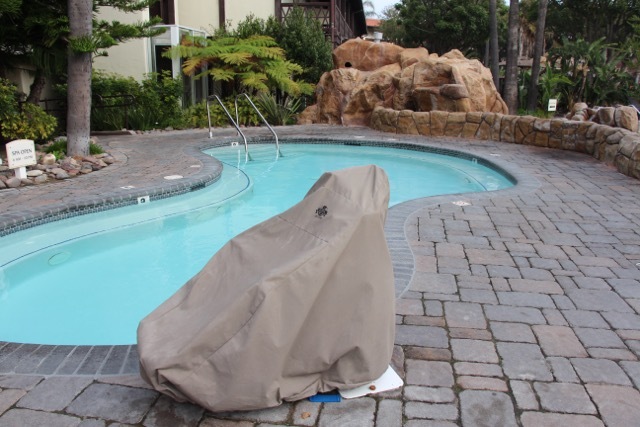 The pool and one of the hot tubs were equipped with battery-powered pool lifts. We had no issue with the lifts and they seemed to work smoothly using a handheld remote. There was direct beach access at the hotel. There was a gate in the back that led right to the sand and a long accessible pathway along the edge of the beach. If you turned right, it led you to a beautiful park with a large playground. 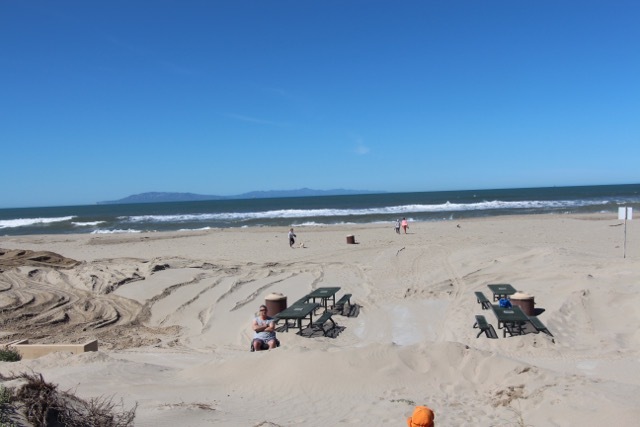 There was an accessible pathway through the sand so that wheelchair users could get closer to the ocean. 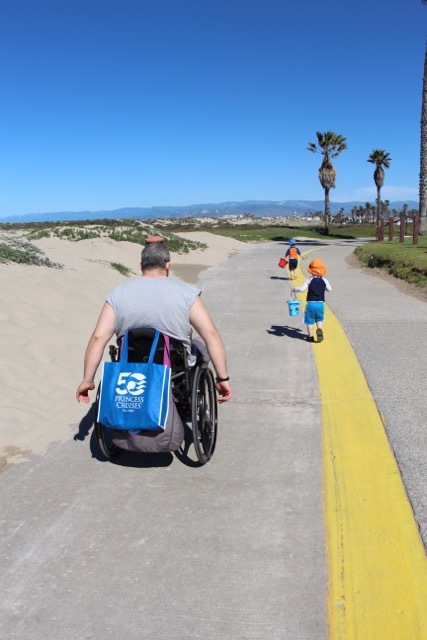 The beaches were extremely large and there were lots of sand dunes, so one would not be able to get to the water in a wheelchair but you would be able to get close enough to see over all of the dunes and to watch the waves roll in. There were picnic tables up near the end of the accessible pathway where you could sit and have a nice lunch or dinner on the beach if you wanted. In terms of its general location, this hotel was within walking distance of a number of beautiful harbours where you could look at fancy boats and beautiful homes. We also drove around and explored a number of shops, grocery stores and restaurants. There was a family-friendly restaurant close to the resort called Toppers that served some of the best pizza we have ever had. We learned when we were there that Oxnard is surrounded by fruit farms. It’s quite something when you are driving there to see the miles and miles of strawberries and other produce growing right there. 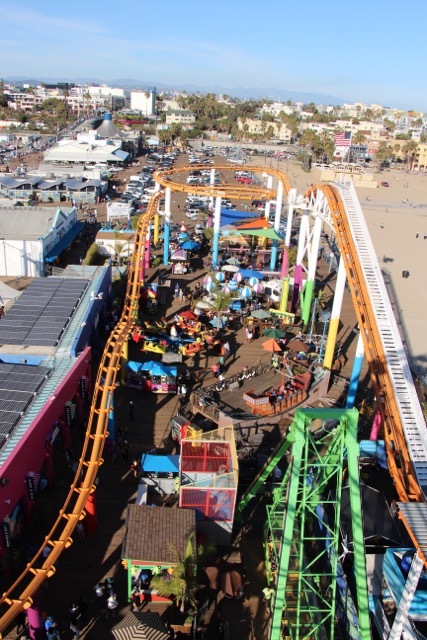 For entertainment purposes, you can drive from Oxnard to Ventura in 5 minutes, Camarillo (where there is a HUGE premium outlet mall) in 23 minutes, Santa Monica (where there is a really fun pier with rides and food, etc.) in one hour and Solvang (which is a very cool Danish tourist town) in one and a half hours. 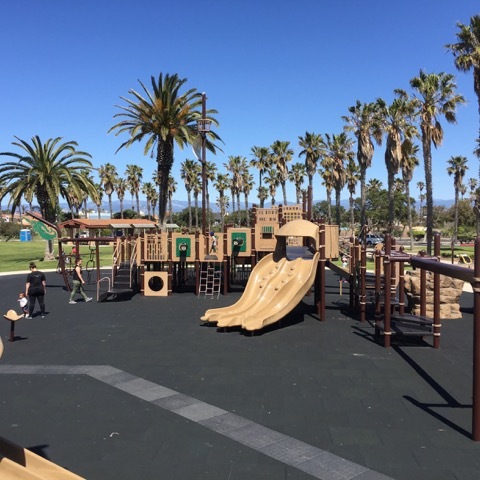 We thought Oxnard was ideally located for fun day trips with the kids. I really had to think about something bad to say about this hotel. All I could come up with was that the food was not amazing and it would not be somewhere I would recommend to someone travelling without kids. We were there during spring break, mind you, but this is not a peaceful adults-only type hotel. It is definitely geared towards hosting families. The only thing that was ugly in my view was the bird poop on our deck. We were on the top floor and there were wooden slats above our deck that the birds sat on. 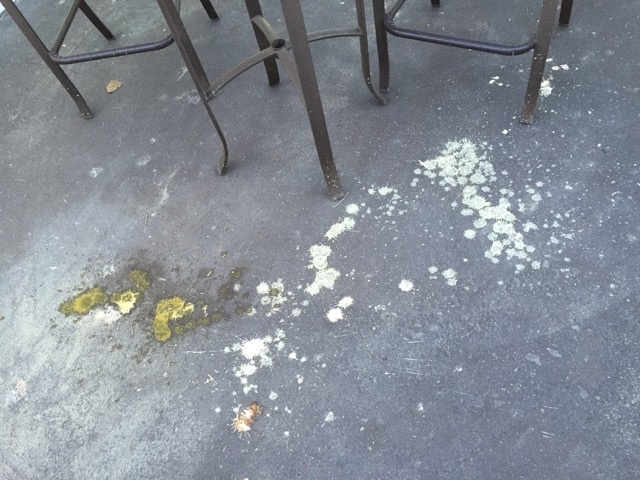 Every morning, the deck, the deck chairs and the deck table were covered in fresh bird droppings, which made the deck unusable. 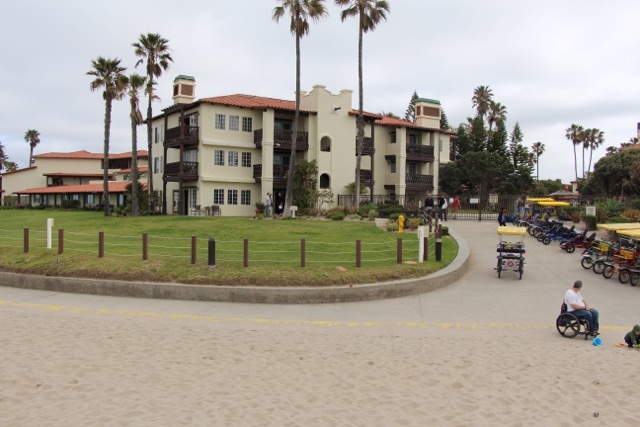 Overall, we thought this hotel was great and that Oxnard in general was a total hidden gem for those in wheelchairs and for families. We tend not to go to the same place more than once but we both agreed that we would definitely return here in the future. We left feeling like there was still a lot more to see. We stayed at this hotel in the summer of 2015 for one night. 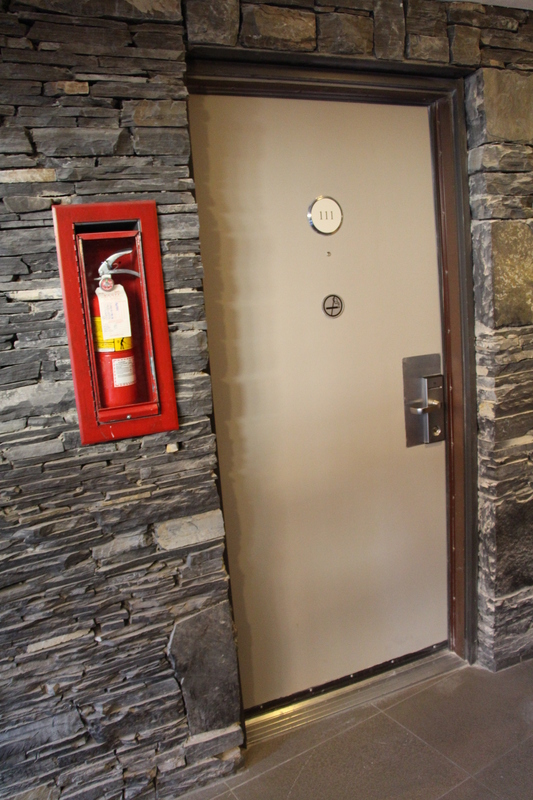 After researching a number of Banff hotels and asking questions about accessibility, this one seemed to be the most cost-effective option with the basic accessibility features that we needed for a one-night stay. The location of this hotel is excellent. It is right on Banff Avenue, which is the main street that most of the shops and restaurants are located on. It is about one block away from the beginning of the main shopping district. It is also one block away from a Safeway store, which is really convenient if you need to grab some food or, in our case, some children’s Tylenol. Our room was located on the main floor, just off of the hot tub area. Our room was simple but clean. One of the nice things about the room was that there were two queen beds on different sides of the room, with the bathroom in the middle. It made the room seem very large and almost created two separate bedrooms. 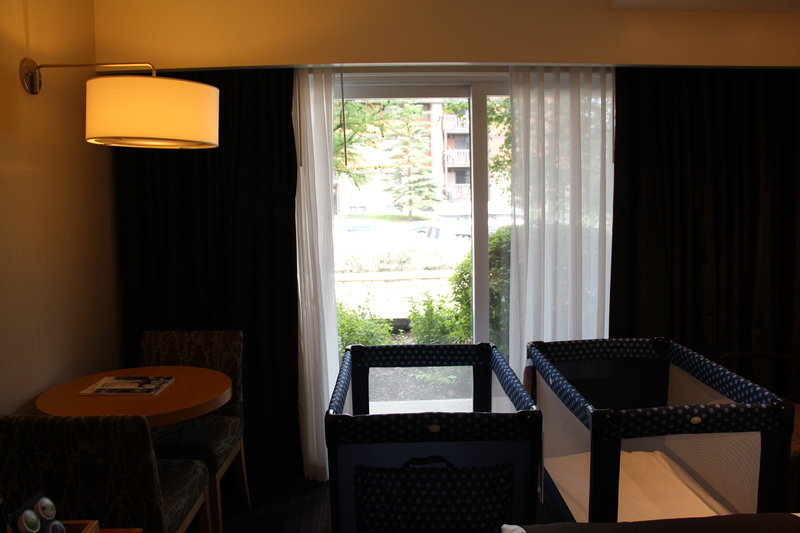 On the side with the patio door to the outside, there was ample room for two pack-and-play-style cribs, which the hotel supplied. Without the cribs in the room, there would be lots of space on this side for a wheelchair to move around. There was a grab bar by the toilet in the bathroom and the sink was wheel-under. Our room did not have a wheel-in shower. We were okay with the bathtub for the one night so I did not inquire as to whether they had a shower bench or whether other rooms had wheel-in showers. 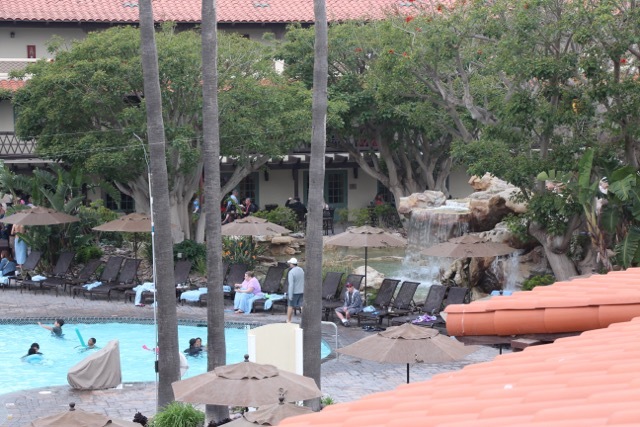 The hotel did not have a pool but it did have two hot tubs, which were located in the central courtyard area of the hotel. The hot tub area was open to the sky, so there was quite a nice atmosphere in there. The hot tubs were very warm, but not so uncomfortable that the kids wouldn’t go in. 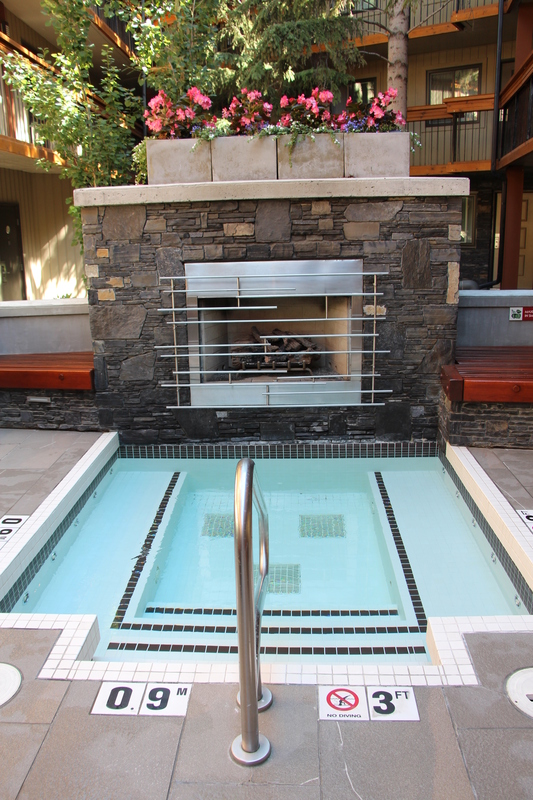 One of the hot tubs faced a nice, outdoor fireplace. 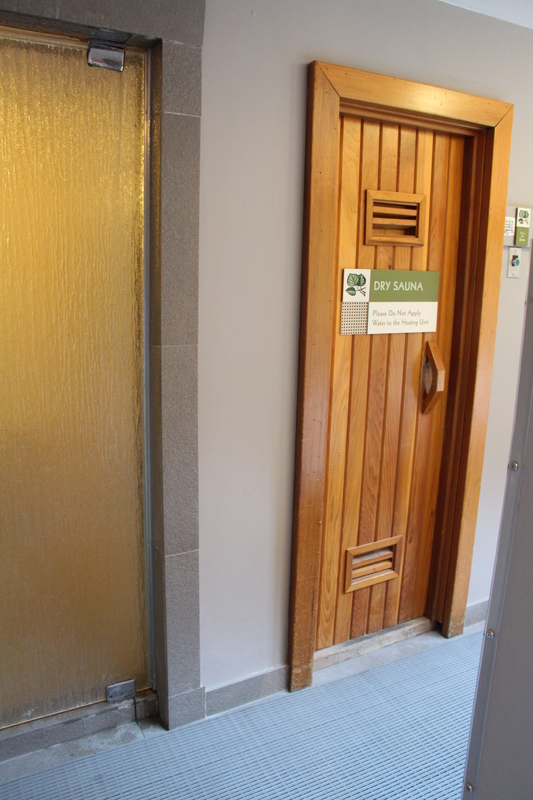 There was also a steam room and sauna located right beside the doors leading in to the hot tub area. One of the big advantages of this hotel was that the room rate came with a free breakfast. It wasn’t just a continental breakfast either! They had eggs, toast, bacon, cereal, muffins, yogurt, home-made granola, etc. The breakfast was served downstairs but there was an elevator on the main floor for access to the breakfast room. Parking was included with our room rate as well and there was a small underground parking area and ample parking in the back (covered). We had no trouble finding an accessible stall and we had a very short walk to get inside from the outdoor parking area. This hotel is not at all the same calibre as the Banff Springs or the Rimrock, but it was also much cheaper than those alternatives. On the weekend we stayed, the Rimrock quoted us $358 a night (with AMA) plus $18 for parking and no free breakfast. The Banff Aspen Lodge cost us $269 a night with free parking and a free breakfast. The bathroom in our room was a little bit small. My husband did okay transferring on and off the toilet but he could definitely have used more room. 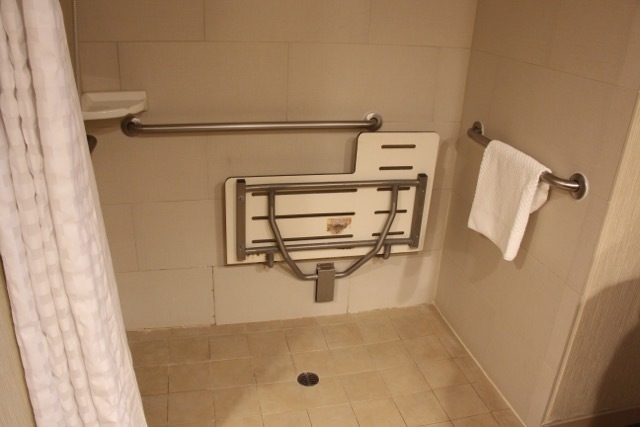 We didn’t need a shower for the one night but I am always surprised when an “accessible” room has no wheel-in shower. 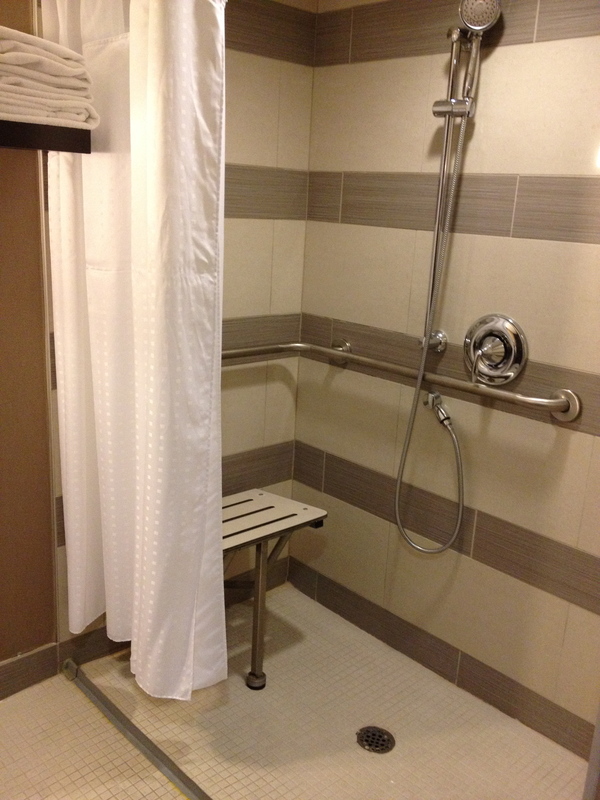 The steam room and sauna would not be accessible by wheelchair as the doors to those rooms were too narrow. The outdoor patio would not have been accessible by wheelchair as there was a large lip that a wheelchair would not have been able to manoeuver over. The breakfast room downstairs was accessible by using the elevator but the food was located down a couple of stairs. They had four tables on the main level where someone in a wheelchair could sit to eat. We sat on this level but I had to run up and down the stairs to get food for our table. By far the worst thing for us was that we stayed at this hotel during a heat wave (30 plus degrees outside) and upon entering our room, we came to realize that the hotel did not have air conditioning! We wanted to sleep with the patio door open so badly but because we were on the ground floor facing the street, we thought this might not be a great idea. 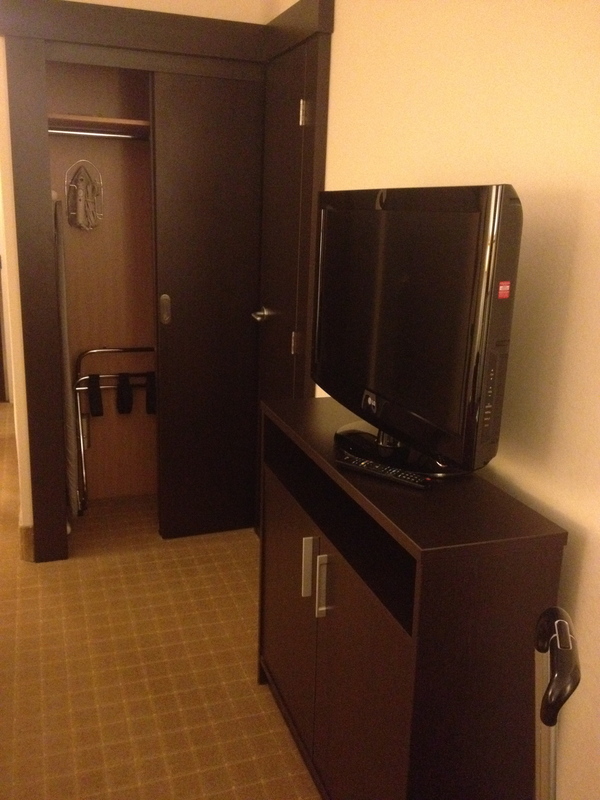 The only ugly thing about this hotel experience was that our room was so unbelievably hot. They supplied us with three fans, 1 of which worked and 2 of which were broken. We went to the front desk to ask if they could find us something else and they did locate a big fan for us (although it was dirty and looked to be about 20 years old). Overall we were happy with this choice. The location couldn’t be beat and with the free parking and free breakfast, we felt it provided a good bang for our buck. If I had known in advance about the lack of air-conditioning, I might have requested an upper-level room with a patio door that I could leave open all night. This hotel is located on 30 Carlton Street, Toronto, Ontario (there are a couple of Holiday Inns downtown). 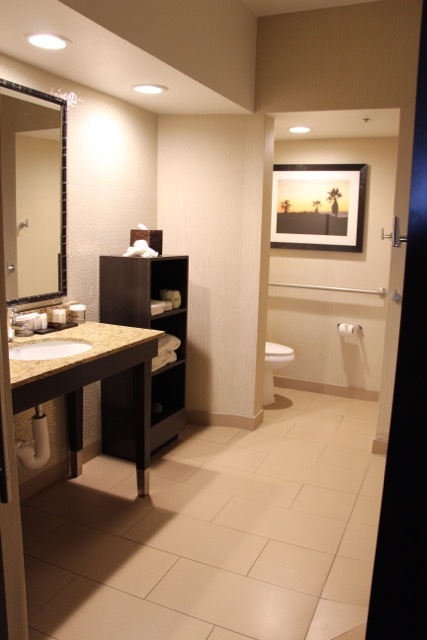 I stayed here for 2 nights on business in 2014 but was able to view the wheelchair accessible room while I was there. This affordable hotel is just off Yonge Street in downtown Toronto. 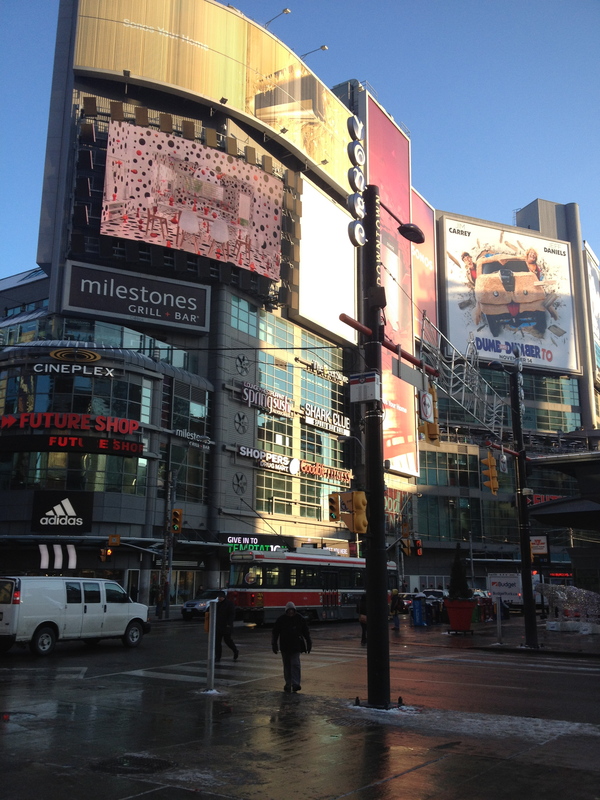 While it is a bit further towards the north side of downtown, it is only a 10 minute walk to the Eaton’s Centre. It is less than a block away from the entrance to the subway, next door to a Loblaws grocery store and across the street from several small, independent restaurants. There was a restaurant in the lobby of the hotel for those interested in a sit down meal and there was also a Starbucks connected to the front of the hotel. I particularly appreciated the fact that there was a Subway restaurant across the street from this hotel and there was a big Winners store on the corner of Carleton and Yonge Street. 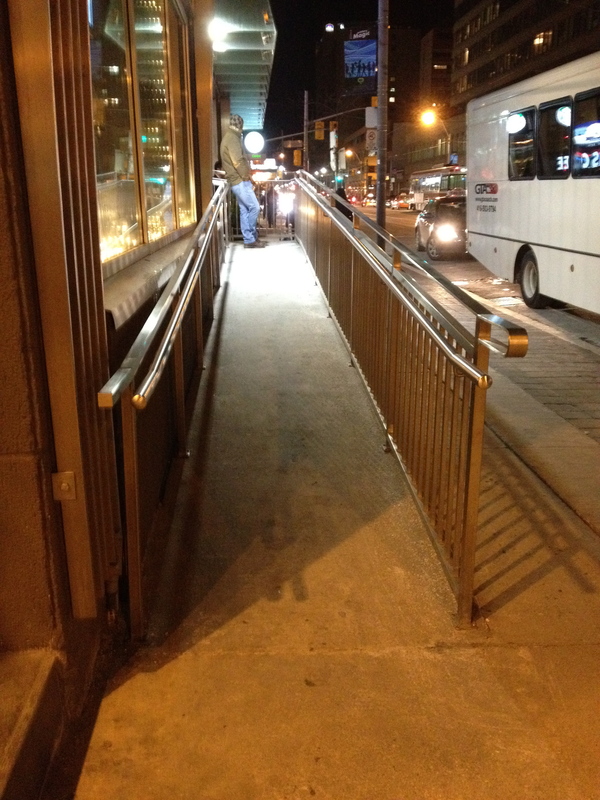 There was a large ramp at the entrance of the hotel for wheelchair access. 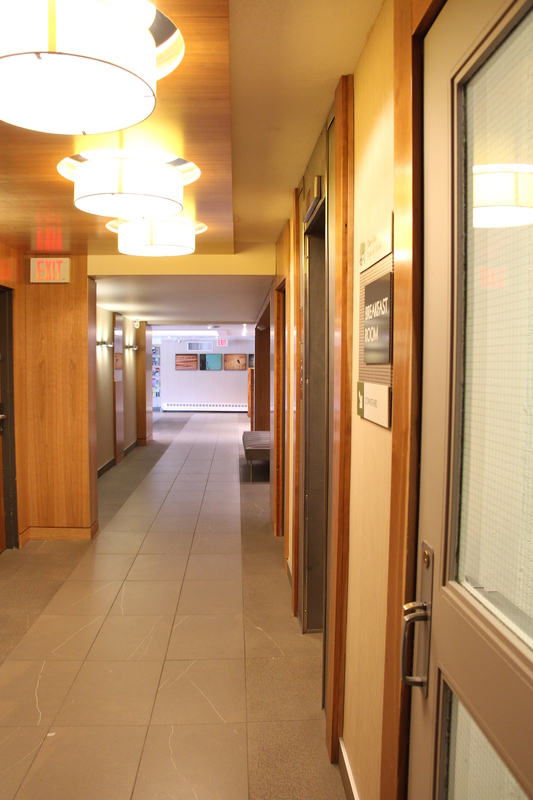 The doors into the hotel were automatic, the lobby was accessible and there were elevators for access to each floor. There was a pool at this hotel, but no hot tub. The pool was located on the 6th floor and it was accessible. 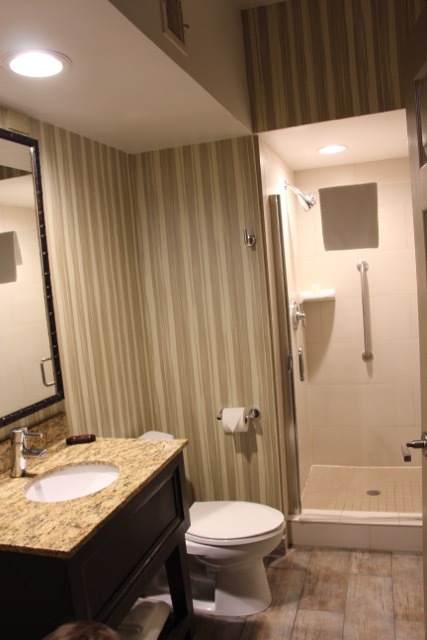 The bathroom immediately outside of the pool area was also relatively accessible, with large showers, wheel-under sinks and a large changing area. The water in the pool was very warm. There was a gym at the back of the pool area. The gym was accessed by walking up a few stairs. I did not see any wheelchair access to the gym, although I didn’t use the gym so I may have missed it. 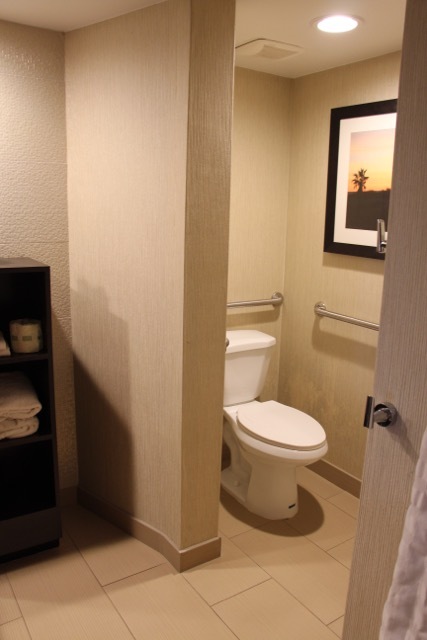 The wheelchair accessible rooms were very small but functional. They had a wheel-in shower, a wheel-under sink and grab bars by the toilet. There was a built-in shower bench in the shower. 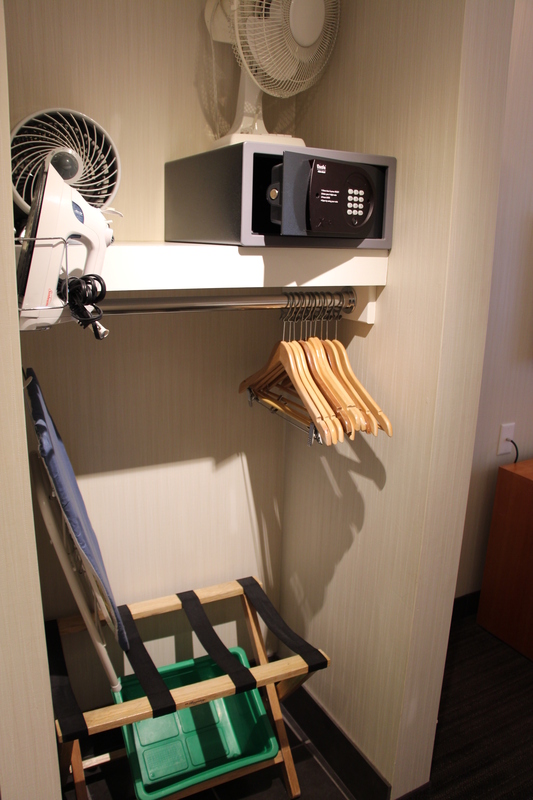 The rooms had a mini-fridge, a TV, a desk, a chair, a safe and an iron and ironing board. The trip to and from the airport in a taxi cost about $65 each way and it took about 30 minutes. There was nothing luxurious about this hotel. It was basically a cheap place to sleep. The carpets were dirty and although the bathrooms appeared to be recently renovated, the rooms appeared run down. The decor was a hideous orange colour and could definitely use some major updating. There was no view to speak of. The window overlooked an alleyway. 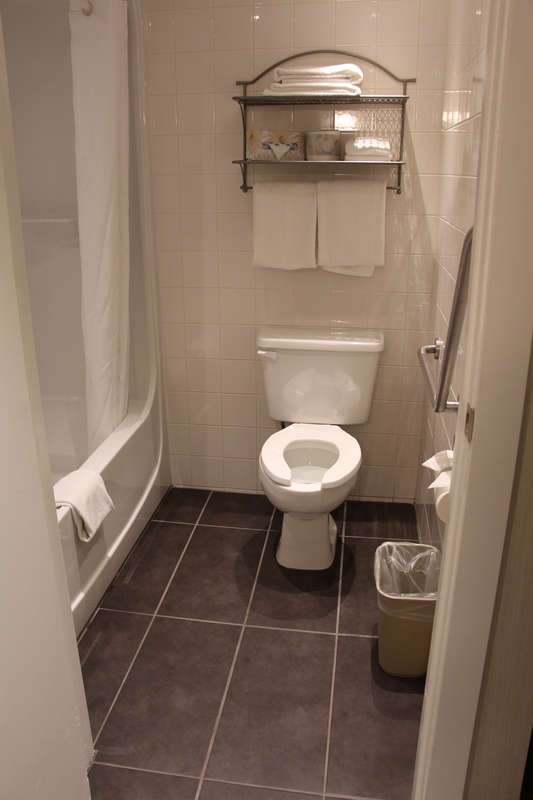 The bathroom in the regular (non-accessible) room I stayed in was extremely small and had no bathtub (only a shower). The location of this hotel isn’t great if you want to be in the heart of the action. Although it is only 10-15 minutes away from the central part of downtown, this may be too far for some people. This hotel is also not in a location where you would want to be out walking around by yourself late at night. It is a bit too far from the main action and it is very dark on this street. The rooms in this hotel are really ugly. I felt like I didn’t want to touch things in the hotel room because everything looked so old and dirty. You typically get what you pay for and this hotel is no exception. While this isn’t an amazing hotel, I think it is a good alternative if you are looking for a cheap place to sleep in downtown Toronto. 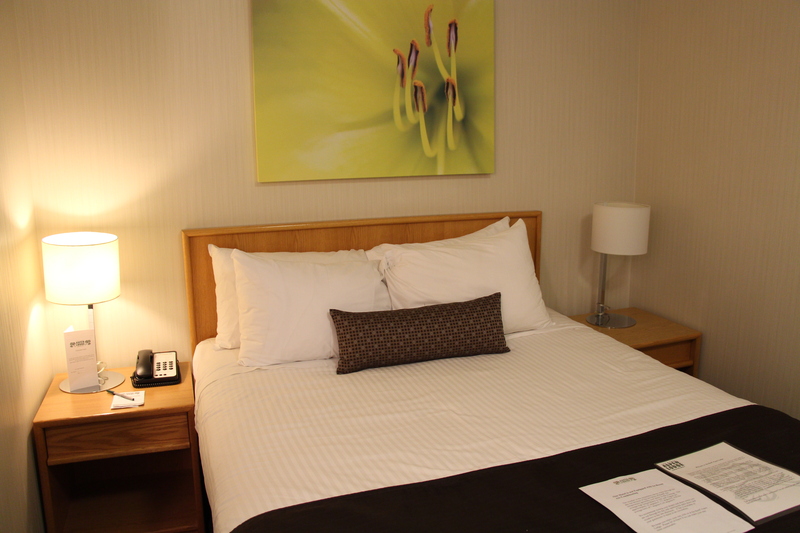 A nice hotel in downtown Toronto will cost you over $250 a night. This hotel cost me $150 a night. 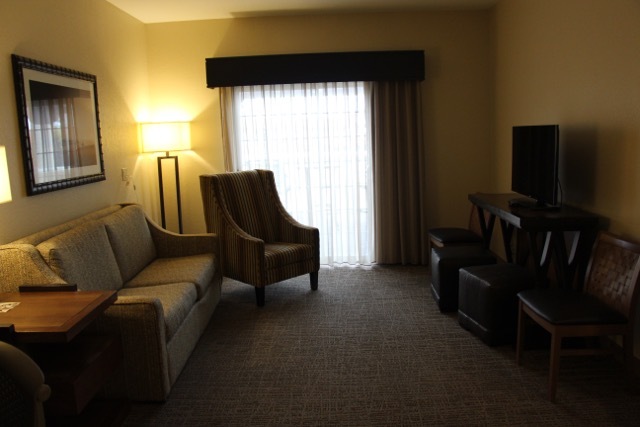 Considering it had easy access to food, good wheelchair accessibility and was close enough to the heart of downtown to walk/wheel there, I thought it was a decent choice for a short stay.